The MegaChlor requires no pool or swim spa modification. Designed for Swim Spa or Pools less than 15,000 gallons. 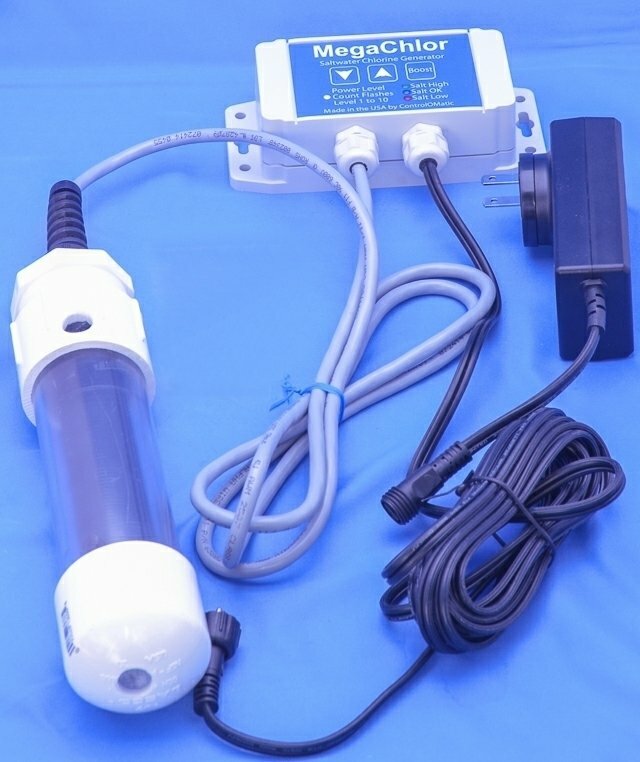 Simply attach the control panel near the pool, add 2 pounds of salt per 100 gallons of pool water, hang the cell into the water and plug it in. The MegaChlor makes chlorine on a cycle of chlorine production based on the power level and then 3 hours off. After the on time which is based on the power setting it will turn off for 3 hours and remain in standby mode, then it will repeat. At power level 5 it will be on for 4 hours, off for 3 and repeat. If you use the pool and let the MegaChlor know by pressing the boost mode button, it will start a production cycle.